S.T.A.R. Pilates is committed to providing high quality group exercise classes that both challenge and respect the body. While teaching in a group environment, our instructors maintain awareness of individual needs and conditions. Modifications of exercises are made to suit individuals of different levels. Class Sizes Are Limited – Reservations Are Required! This workout involves Pilates exercises that are done while lying or sitting on mat, utilizing one’s own body weight for resistance. The total body workout strengthens the core, tones the hips and thighs, and flattens the abs. Small equipment may be added for additional resistance training. This class is MAT CLASS with the addition of small equipment. 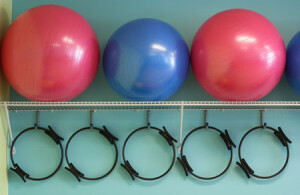 Large physioballs, small 9″ balls, Pilates rings, exercise bands and small weights can be layered into class challenging muscles with added resistance. Intermediate Group Reformer is for participants that are familiar with the machine, terminology, exercises and have body awareness of themselves. Advanced Group Reformer is for those extremely experienced on the reformer and can follow multiple directions at once. Prior Pilates experience is mandatory to join this class. 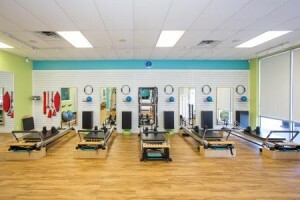 Class utilizes Pilates equipment known as the Stability Chair as well as bands, balls, Pilates rings and free weights. The major difference between Chair & Reformer is that there’s more vertical work than reformer (standing and sitting vs. laying down) and more balance work, hence the prior Pilates necessity. The M.E.L.T. 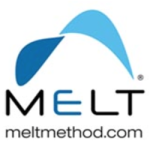 Method is a revolutionary approach to longevity focused on our connective tissue and neurological systems. It can offer positive changes such as improvement in the lower back, greater neck range of motion and better mobility in the hip and shoulder girdle. Foot problems can also be alleviated, most notably plantar fasciitis, but even peripheral neuropathy. Arthritic hands often feel better after utilizing the M.E.L.T. Method. 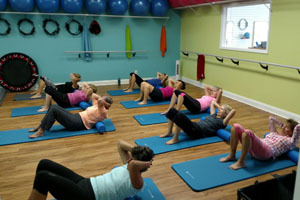 The class utilizes specialized soft foam rollers and MELT balls on the hands and feet. Flexibility training is the most undervalued component of body conditioning and is key to reduce your risk of injury. Learn good technique for sustainable flexibility training, a routine and have tools for continued practice at home. Focus will be on a variety of stretches using bands, foam rollers, and balls. This special clinic is limited to 6 people so that everyone gets close attention and progresses together. Class is especially for those with Osteoporosis/Osteopenia. Improve bone density utilizing a rebounder, free weights, resistance bands & balls. Infuses the core-strengthening, immune system bolstering benefits of rebounding with the alignment and postural benefits of Pilates. 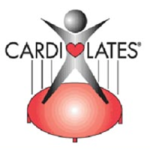 This unique Cardio-Pilates class begins with Pilates exercises performed on the rebounder to ensure that the abdominal muscles are working and the core is strong. Then the real calorie burning begins with 35-40 minutes of rebounding at various intensities to keep your heart rate up and your core muscles engaged throughout. Light weights are utilized to tone the arm muscles as well.